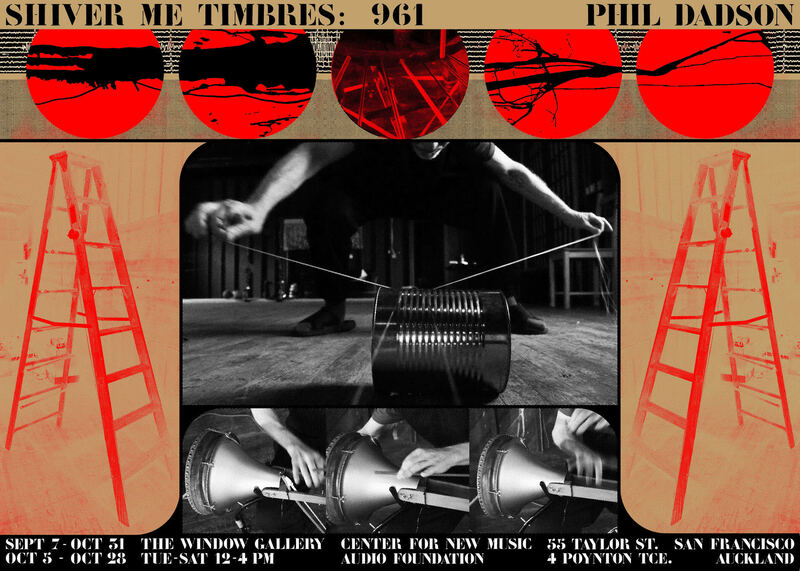 Join us for the opening of “shiver me timbres” – solos and collaborations with a multi-voiced instrument by Phil Dadson. 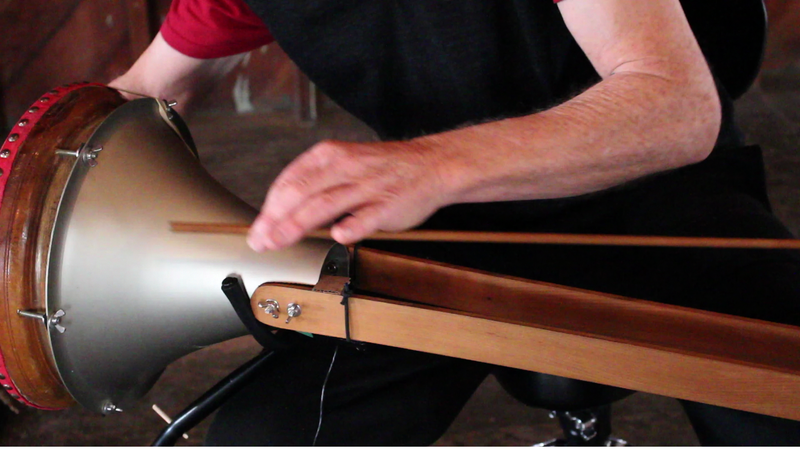 During his 2016 summer residency at Headlands Centre for the Arts (Sausalito), New Zealand based artist/musician & instrument builder Phil Dadson converted an old, wooden ex-US Military store – building 961, into a sonic play-space, an expansive instrument with multiple voices that he worked in and performed on. Dadson’s exhibition presents a range of the instruments and sonic objects he devised during the residency, including the ‘rocker-gamelan (an adapted rocking chair), the ‘rung-ladder’, wall and floor wires, wall rods and a set of his invented instruments – the Gloop spring-string-drum, song/stones, gliss-flutes and one of his tribute instruments, the BartHarmonic, dedicated to Bart Hopkin. Video/audio documentation of his solo performances with wall-wires, floor-wires, wall-rods, rocker etc is exhibited in the window along with visual-music graphics by Dadson and a poster co-designed with Berlin based artist-friend Gwenaël Rattke (also a Headland’s resident during summer ’16), screen printed in Berlin by Rattke especially for the show. (Headlands Residency courtesy of the James Wallace Arts Trust & Fulbright NZ). Phil Dadson; sound & intermedia artist with a transdisciplinary practice including solo performances and exhibitions; building experimental instruments, video/sound installation, music composition & graphic scores, sound sculptures, sound-stories and improvisations with invented instruments; Founder of New Zealand’s most original rhythm/performance group, From Scratch. Following membership of the foundation group for Scratch Orchestra (London, 1969, with Cornelius Cardew, Michael Parsons & others), founded Scratch Orchestra (NZ), and later From Scratch (1974) – known internationally for its funky rhythms & cross-rmedia performances on original instruments. Co-authored The From Scratch Rhythm Workbook with Don McGlashan, published by Heineman USA – a hands-on manual of rhythm teaching games, exercises & invented instruments, derived via the from scratch experience. Co-authored Slap tubes & Plosive Aerophones with Bart Hopkin, EMI 2007. Awarded NZ Arts Foundation Artist Laureate 2001. Antarctic Artist fellowship 2003. ONZM 2005. Sanskriti Residency award 2007. 9Dragon Heads collective, Venice Biennale 2015, Wallace/Fulbright Headlands Residency award 2016. Represented by Trish Clark Gallery, Auckland.